I have a daughter that is about to be born. My wife is gloriously pregnant. My 8-year-old is excited but doesn’t really know what to expect. My 2-year-old has no clue and is more concerned about where is superman cape is more than anything and I am sitting here trying to wrap my mind around how my world is going to change when my Jovie Marie Delk busts onto the scene. For context, the last time I had a small female living with me, all be it a brief time, was my niece Katlyn. I do recall the pig-tails and the make-up attempts but one thing that didn’t “really” exist too much some 20 plus years ago, except for the cheer camp week and a local football game was the strange and if I dare say it, completely ridiculous at times ecosphere of what is, the bow. I’m a little intimidated by them, I think. Or maybe I just don’t understand them the way I feel I should. Either way, this is a world I am completely unfamiliar with, but I am not shying away from it. In fact, I think I will embrace it head on (no pun intended). Much like my pastor said this morning, if things aren’t changing – their dead. The newest change for me is embracing something I am not familiar with, made fun of in certain contexts and at times “don’t get.” So, I thought I would tell you about an experience I had and see where it takes us. Julie and I recently visited a children’s boutique. I don’t mind a boutique, much less one for children. But in the past, we had been solely focused on boy clothes. Which if you are familiar with the male scene in a boutique – it’s the very small corner section in the back - that’s it, simple. The female section though...different ballgame. With the overwhelming scent of fabric and Etsy in the air, I began to perspire estrogen after walking around the store for a mere two minutes. Then I found “the wall.” This wall covered in bows consisted of numerous colors, sizes and materials ranging from sheer to wool covering the entire gauntlet of the visual spectrum. It was beautiful. Now these bows were what I would account for being “normal size.” Granted, I have no idea what ‘normal size’ would be in terms of head adornment, but the proportions seemed accurate. I began to follow the wall downward and I was led to four baskets on the ground. This is where things got interesting. Above the four baskets were sizes. Beginning from left to right they ascended from Small – Medium – Large – Extra Large. In hindsight, I should have left my mouth shut and simply looked away or perhaps I should have ventured over to the stuffed animal section. Heck, maybe to the children’s book section to scope out the competition. However, I made the mistake of asking the young lady behind the counter, “Really? There’s an Extra-Large size for a bow?” She didn’t seem shocked at my query, nor did she hesitate in her response, “Oh they go way bigger than that.” She then motioned for me to look on the other side of the bow wall. I step around to the other side. At this moment, I feel it only necessary to say that I had no idea where Julie was during this time. Remember, I was staring at the bow wall in memorizing form for quite a while, I guess. I say this now, as I have told this story to other people and they wanted to know where she was. So, this answer is still, “I don’t know.” Anyways, back to the other side of the wall. I look down and there are MORE BASKETS. In fact, there were three additional baskets. They were labeled XXL, XXXL and XXXXL. I was in utter shock. Disbelief. Denial. Whatever the word - I was it. The XXXXL bow is real folks. I said to myself, “You’ve got to be kidding.” But I wasn’t kidding myself. These bows were real. What was even scarier, there were only a couple left in the XXXXL section! It was at this time in my boutique journey that I had to find Julie. It was very important for me to inform her of not only what I had just found but what this could mean for our little girl if someone (Because it wasn’t going to be me) bought this XXXXL bow for her. For instance, if this bow was to be purchased, the sheer weight from the material alone would prove to be an instant health hazard for her neck. No way could a small child under the age of 12 be able to support such a bow. Additionally, that bow could not be worn into a federal facility, plane or any building with a metal detector. Why, you make ask? Well, because the clip by itself could be used as an impromptu letter opener, a toothpick for sasquatch or a prison shiv. Granted, I'm not one to dwell on the negative here, I also recognize the positive in such a gigantic piece of female accessory. The bow material itself could be rolled out and used as a blanket. The clip could serve as a cutlery utensil in the event someone needs to cut a birthday cake and they don’t have a knife large enough. I could go on. Back to Julie, she comes over to the wall. She takes them all in giving them each a glance. I motion for her to come over to where I am. When she arrives, I give her the signal to look down at the baskets and the ridiculousness that’s set before us. I am met with a, “Yeah babe, they have big bows” follow this statement with a quick shoulder shrug and I'm left alone again as she has moved onto the section of twill skirts. At first, I didn’t know how to accept this response from my wife. Surely, I (of ALL people) was not blowing something out of proportion here. I saw what I saw. I had to investigate further. I found Julie in between a sea of red velvet dresses and woodland creature onesies. “Julie...that bow was huge! It was a XXXXL. I didn’t even think that size existed in clothing, much less an accessory! 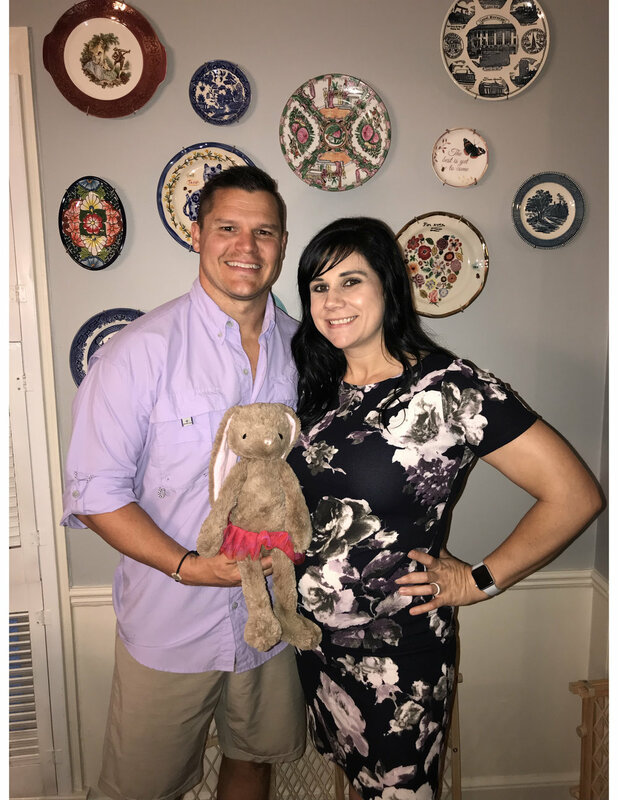 ?” It was at this point Julie recognized my confusion and began to inform me of not only the different sizes of bows that were available for today’s toddler but how I should go ahead and prepare myself for the impending bowocolypse that will happen. Fast forward a few months and we have a fantastic baby shower for little Jovie. Julie opened every gift with a huge smile on her face and a grateful heart. She would pass the gifts to me and for about 75% of the items I was handed I know exactly what they were for. I got a little tripped up on the leg warmers...but I'll save that for another blog. We got through the gifts and to my joy and delight we did not receive a bow in the size of XXXXL. My daughter's neck is safe, for now. We did get plenty of bows though. 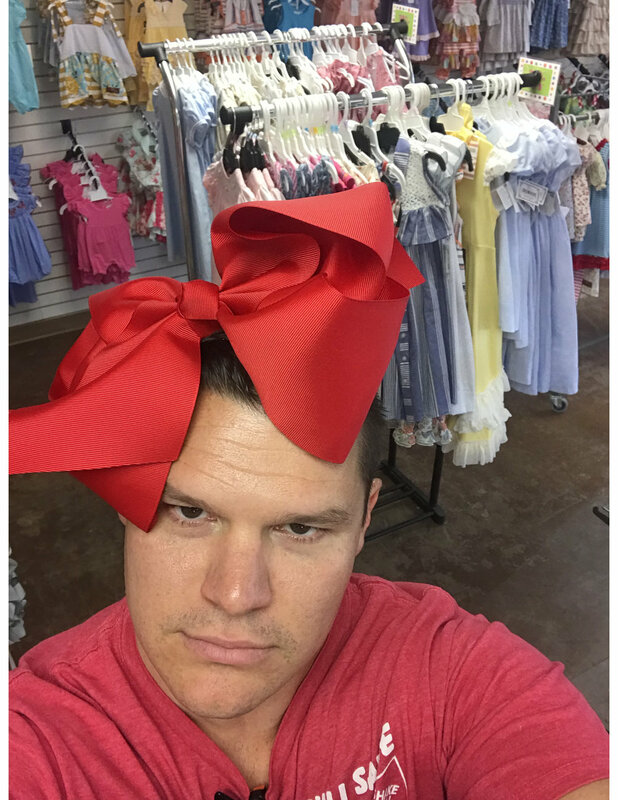 As for me and this new line of clothing...let’s just say, I embrace the bow.